Outgoing Indian High Commissioner Harsh Vardhan Shringla has termed Bangladesh as one of the most successful countries in the world. “Bangladesh is one of the most successful countries in the world. The success story of Bangladesh is really remarkable, especially during last one decade,” he said. The outgoing Indian envoy was delivering his valedictory speech at a farewell reception at the chancery complex in Indian High Commission in Dhaka on Sunday evening. “As a best friend and neighbour, India wants to see a prosperous, stable and peaceful Bangladesh,” he said. He mentioned that he had visited most of the districts of the country during his tenure in Bangladesh as the Indian High Commissioner for last three years. “I have found the people of Bangladesh very generous, hardworking and helpful,” he stated. “This is why, I always feel at home here and I am leaving this country as if I am leaving my home,” he said. The outgoing Indian envoy thanked all for what he said their unconditional help and assistance that he had received for enhancing the bilateral relationship between the two countries. “I have never witnessed such love and affection from any country what I have experienced in Bangladesh,” she stated. “Bangladesh inspires hopes in me and others and I will never forget the hospitality of the people of Bangladesh,” she added. 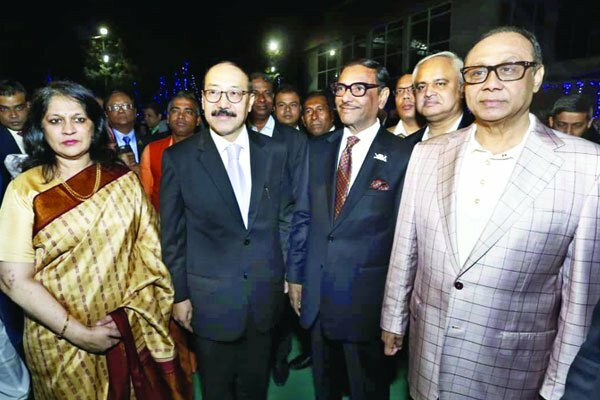 A host of politicians, ministers, lawmakers, diplomats, journalists, officials and businesses flocked in droves to the reception ceremony to bid farewell to the outgoing Indian high commissioner. Awami League General Secretary Obaidul Quader, State Minister for Foreign Affairs Md Shahriar Alam, Bashundhara Group Chairman Ahmed Akbar Sobhan and Information Minister Hasanul Haq Inu attended the event, among others.